"Darling, I hope that my dream never haunted you"
Meu Canto Sem PazDe Rosas E Coisas AmigasEu Hein, Rosa! 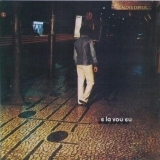 E Lá Vou Eu (this album) (1974). Sorry, no matches on eBay for "De Rosas E Coisas Amigas Joao Nogueira".